I’ve been trying to write this blog all day, but I keep getting distracted. It’s just after 7 pm and I’m sitting at a picnic table near the kitchen. Loud, helicopter-esque wing beats just a moment ago announced the arrival of one of our Laysan Ducks, Yellow Y. She flew fairly quickly past me and now there are three more ducks leisurely walking towards our outdoor sink. Earlier today, I was trying to write while I was sitting on the beach but large shadows continually swept across my notebook paper and I kept looking up to see the underside of giant frigates, sooty terns and ruddy turnstones. The wildlife has been distracting me all week. Walking low on the beach to work one day, four brown noddys literally slowed down their flight to match our team’s pace for about a hundred yards. One of the birds flew less than two feet away from my head at eye level. I wanted to hit my colleagues to make sure they were seeing what I was seeing, but birds hovering overhead or next to us are fairly commonplace. For me, these experiences are extraordinary but not altogether surprising. 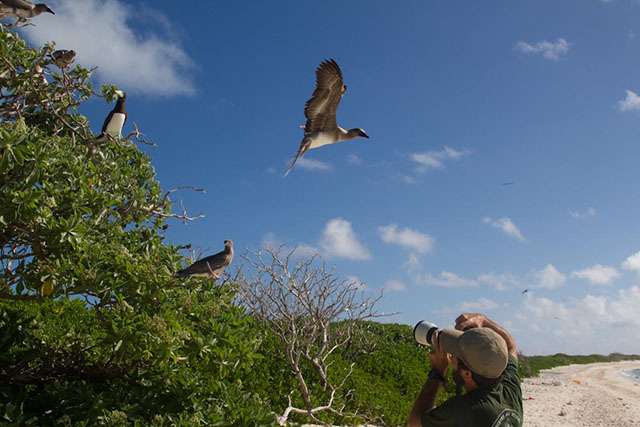 Seabirds often exhibit what’s called ‘insular tameness’ a behavior where they lack the wariness that is commonly observed in birds that live in areas with terrestrial predators. And the ducks, well, they’re just being ducks. One of the most important lessons this week has been about the animals. In this wildlife sanctuary, they come first. Knowing and minimizing the hazards we pose while working and living in Papahanaumoukuakea Marine National Monument is a major priority. On seabird colonies, like this one, birds nest under the ground, on the surface and in the shrubs. Combined, these habits mean that our team rarely walks in a straight line. We try our best to avoid burrows and give a wide berth to birds and chicks sitting above ground. Unfortunately, despite our efforts and due to the sheer magnitude of bird life all around us, our work means that we occasionally disturb the birds. Our body weight can cave in a burrow. When that happens we immediately stop what we are doing and dig out the chicks. Walking in a single file helps limit the number of cave-ins. Additionally, we try not to stray too close to resting birds as one of their responses to stress can be to regurgitate their last meal. When we are near the coastline, we lower our voices in case a Hawaiian monk seal is near. The monk seals may be trying to access the beach in order to avoid sharks which predate on them or females may accidentally crush their nearby pup while trying to protect it from us, an unknown threat. In either case, we want to limit our disturbance and the best way to do that is to remain unseen. When we spot a seal, we either walk higher or lower on the beach to stay out of its line of sight or move inland. A second lesson this week was in regards to our work and our chores. It was summed up by the Hawaiian word, kuleana. Hawaiian words tend to have multiple meanings and encompass ideas both big and small. Kuleana defines the obligation and responsibility of a job especially one that is considered a privilege and is carried out with honor. Guiding a tour around the island, Eryn looks ahead, changes our course and says that it’s nice to be someplace where it’s not about us. She’s right. It’s easy to change our route to ensure that a whole flock of birds isn’t disturbed. Similarly, it’s easy to avoid the beach or walk carefully along it in order to ensure the monk seals feel safe on our beaches, whether it’s for a lazy Sunday afternoon nap or as a much-needed escape from the tiger sharks that also frequent our waters. Which brings me to the third big lesson of the week: how to walk like a Kurean. This special walk is slow and steady and flat-footed. It’s a walk full of kuleana. Walking on Kure, I look like a toddler, gangly and uncoordinated as I overthink each step, stumbling when I look up to watch the birds or make sure I haven’t fallen too far behind our seasoned guides. I’ve observed Cynthia, Eryn and Andy lead the rest of us around the island as much or more than I’ve been watching the birds. The lower half of their bodies balanced, their feet moving gingerly, in gentle yet firm steps. From the waist up, they are alert, spotting birds in the air, vigilantly scouting out burrows in the ground and simultaneously pointing out weeds hiding between native plants, with the corresponding Latin binomials rolling off their tongues. Overwhelmed and impressed in moments like these, Martha and I have looked at each other and agreed that we have a lot to learn. Then, we shrug and fall back in line like ducklings.